Halloween means the ghosts, goblins, superheroes, and fairytale princesses all come out for a sweet night of fun and indulgence with friends, family, and neighbors. Seasonal costume shops have popped up at a dizzying rate since the Labor Day grills turned off and the summertime potluck was packed up and stashed away. The essence and heat, of summer has disappeared for now and will become nothing more than a memory until the neighborhood pools reopen around Memorial Day next year. Instead, houses are now decorated with hues of oranges, reds, and golds as they adorn themselves in the more-fitting Fall decor. The weather is starting to take on the chill of cooler temperatures and Georgia and Falcon fans from across the state sit in anxious anticipation in front of their television sets on weekends watching every down and field goal (and overtime). The fall season ushers in a time for entertaining, for cozy sweaters and for a nationwide pumpkin-spiced pneumonia, it is a time when adults and children alike start thinking about spooky costumes and their favorite snack-sized candy. Since October is finally here, Halloween is rapidly approaching and the anticipation of a sweet-infused, candy coma has kids everywhere gitty with excitement. Parents, on the other hand, are scouring the internet and Halloween stores for the exact costume their little ones have requested or alternatively they are hard at work putting their DIY skills to the test to create the ensemble of choice. The spooky evening consists of more than just costumes and terrifying makeup, for many people who do not live in a kid-friendly neighborhood just finding a place to walk the kids around with their small pumpkin canisters or pillowcases can be challenging. This conundrum has lead parents across the country to find innovative ways for their children to participate in the holiday and trunk-or-treats are gaining popularity from coast to coast. 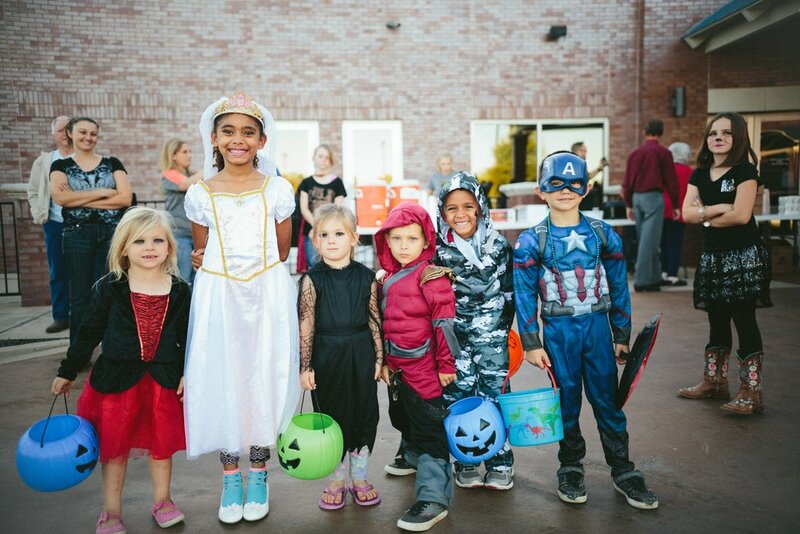 trunk or treat is when drivers line up their cars in an open space or parking lot and distribute candy as youngsters walk from vehicle to vehicle begging for tricks or treats. It gives churches, schools, and organization a way to gather to celebrate the holiday without needing to live in the same neighborhood or even within close proximity to one another. One exciting aspect of trunk-or-treat is the event theme and the ability to get your car involved with the celebration. It is about more than just a great costume, your car also needs to dress for the occasion. Whether you have a car, truck or SUV, you want to open up the back end and set out decorations to encourage all the mini mummies and friendly Frankensitens to wobble to your set up for a handful of sweet treats. When the whole family, including the dog (or cat) and the vehicle, dress up for the festivities it creates a buzz for the children which is palpable and will have them chatting about with their friends the entire year. Costume - probably the single most important aspect of Halloween (or trunk-or-treat) is the costume. Start planning now to gather all the makeup, pieces and accessories you’ll need. Here are some of the most sought-after costumes for 2018 via PopSugar. Candy - Make a name for yourself as the best candy distributor of the year. Think outside the box and hand out some treats the kids will rave about, like these. Be mindful of children with allergies and try to have an alternative option available for them. Decor - Tie everything together with lights, streamers and seasonal adornment. If you can make it work into your costume or the event's theme - even better! Car - The focal point of the evening is your vehicle, so make sure it looks and functions like it should. Consider washing your car and having it serviced prior to pulling into your spot for the main event. The best for service and maintenance in Atlanta for a car, truck, van, or SUV is D.W. Campbell Tire & Auto Service Center in Kennesaw, Georgia. They set an industry standard of integrity, trust, and expertise so if you are planning trunk or treating this year first stop by D.W. Campbell Tire & Auto Service Center to guarantee everything on your vehicle is running with optimum performance and efficiency. Then throw on your costume and grab a plastic pumpkin to get the party started.